First and foremost, I apologize for my lousy before picture. While I was working on this project, I received a phone call that my mom had fallen on a sidewalk outside the tea room she was to celebrate her birthaday at with my sisters and nieces down in California. So, needless to say I was a little distracted. She is fine – just in pain and has two real nice black eyes! The picture above does not show my cool plate I purchased at Michael’s to transform into my Resurrection garden. Oh well! I used a lidded box for the empty tomb by cutting a door in the box. The stone that covered the tomb is a premade ornament that I covered with little stones which I also used on the tomb and the walkway to the tomb. I also covered the tomb with some of the moss as well. Then I used mini succulents and pieces of flower arrangements to put the finishing touches on the garden. A great project for Easter! Have a wonderful Holy week everyone and I hope you have a chance to celebrate Easter Sunday thanking Jesus for dying on the cross for our sins. The reason for the true metamorphosis in my life! 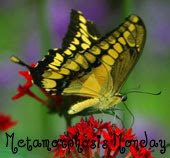 For more Met Monday posts, head on over to Susan’s! « Palm Sunday – Hosanna! It’s beautiful and I’m glad that your mom was okay! This is beautiful!! It’s good to hear your mother didn’t have broken bones. Hope she feels better soon! I got chills when I saw this…the empty tomb! Can you imagine how the Mary’s felt? This is just beautiful. Thanks for sharing and hope your mom is on the mend! Wow! I don’t know what to say. I’m so sorry to hear about your mom. I hope she has seen a photo of your resurrection garden, because it’s very special and quite beautiful. What a wonderful thing to celebrate the empty tomb and our redemption!! I’m so sorry about your Mom and I do hope she gets better soon. How scary to fall. Wow, I’ve never seen anything like this. What a wonderful way to teach the story of the resurrection. Very clever! Oh this is brilliant and beautiful! What an awesome Met Monday post! I was looking at all of your items in the “before” photo…wondering…what you’d come up with and was just blown away with what you created!!! I love how you recreated the tomb and the that the stone had been rolled away! Such a beautiful Resurrection Garden…and I have to totally agree with you…Jesus is the real reason we celebrate Easter and he is definitely in the metamorphosis (life changing) business!!! He transformed my life 31 yrs. ago and I have never been the same!!! Happy Resurrection Day, my friend! Sorry your Mom had a fall but happy to hear she is OK minus those black eyes which are going to be interesting to explain on Easter Sunday. Your resurrection garden is amazing and a good reminder of the Holy week. Your garden turned out beautifully…very inspiring here just before Easter. I would have never thought about doing something like this. It is so wonderful. I know that a lot of people will be duplicating this. Thanks for sharing.